General Zod has been having visions of the future. A future where the last surviving Kryptonians have reached a point in their wars where forging New Krypton is their last option for survival. But like many times before just as the houses of Zod and El are about to come together, the villain Rogol Zaar arrives to wreak havoc and destruction. Zod struggles with the vision and his family worry for him too. Is it a prophetic dream or a nightmare? To clear his head Zod soars through space while in the Phantom Zone, Superman struggles to stay conscious. Rogol and Jax Ur are playing with their prey. Superman flees with the last of his strength while Rogol smirks that Superman is trapped with them no matter what he does. The symbol of hope has none in this dimensional prison. Adam Strange, meanwhile, encounters General Zod just as the Earth reappears and begins to return to its original size around them. As the planet's people reawaken Zod seeks out the Justice League. He finds Ray Palmer, but to everyone's surprise, he asks to be sent to the Phantom Zone. Clark, dazed, confused and filled with rage is calmed by a vision of Jonathan and Martha Kent. They offer him some sound advice and help him regain composure. Rogol, separates himself from his army to rest but while alone Superman returns to confront him. This time not for a fight, no matter how much Rogol tried to goad him. Superman offers a revelation just as a new contender arrives in the Zone hell bent on revenge for Krypton! 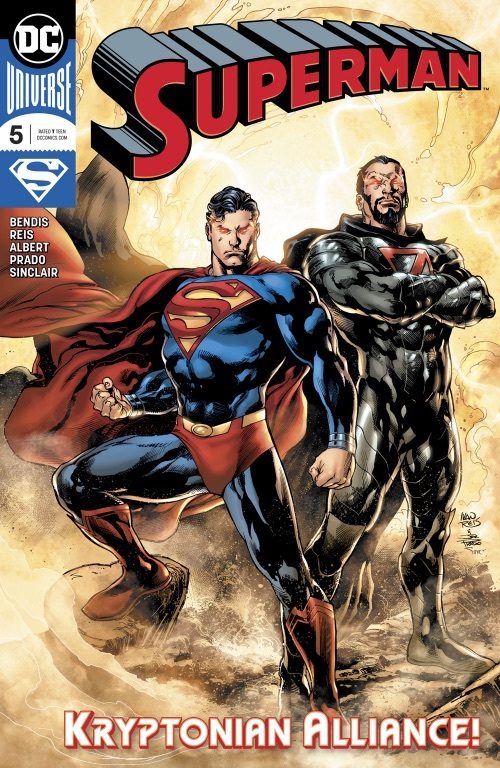 Story - 4: Zod is a Deus Ex Machina but one that was necessary to change the plot direction. He and Doomsday have become lazy writing fodder for many years so it is nice to see him doing something a little different. The visions both Zod and Clark see galvanize the plot. You really have to read them to see why they are both incredibly important to both hero and villain. New Krypton and the Kents are both important parts of the Superman mythology and what they offer for the future could change things for both men. The scene with Atom seemed too convenient (and too fast) but for what it led to; I can be forgiving. I find myself wondering about Adam Strange too, is he trapped here? I'd like to think he was more than a plot device/cameo so let's see what the future brings. I just thought I'd mention that Rogol is finally starting to get fleshed out and with Zod knowing him personally I'm hoping we'll get some more development. Someone must be listening because I want more than a Doomsday rip off. This arc has been a rollercoaster so far, struggling to find its feet after altering all that Rebirth put in place. It's been a mixed bag in separate issues but as the story grows the parts begin to earn cohesion. Art - 5: Loved the entrance to the Zone, that was pretty epic. The art was solid but this issue relished the dramatic beats more than the violence. A refreshing change of pace for the slower, dialogue driven scenes to take centre stage over the big splash pages. Don't let this art team go anywhere for a while please! Cover Art - 4: A bit of a tease, much like the visions, but still a visual feast. The hero and villain team-up has been done to death of course but it never fails to excite! How much a difference they will make standing up against Rogol, Jax and the other prisoners actually has me eager for next issue. Their poses here convey their characters perfectly, you can almost hear their dialogue in your head. Variant Cover Art - 5: What a homage! I love the nod to Superman #32! You can really see that there is a lot of love for the character. 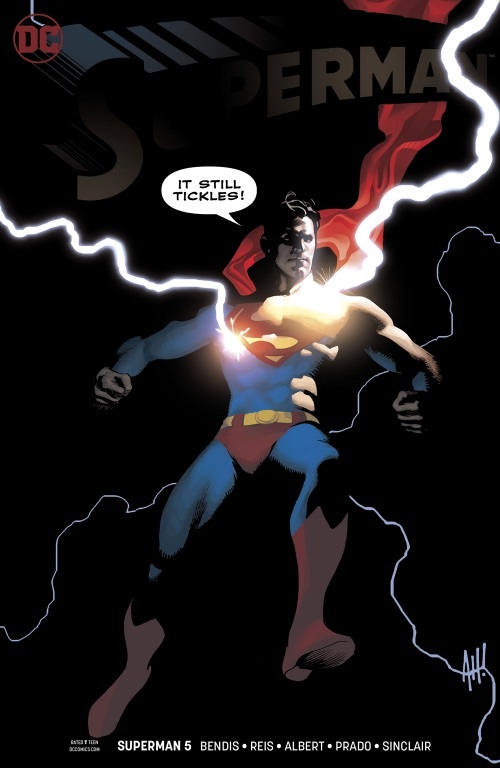 It's also nice to see such a stylistic take each issue on iconic scenes from Superman's history. Seeing these covers are a definite highlight each issue.